Illusions of a Noetic Monk: "Two-ness"
There's lots of patronage within spiritual circles given to the "Oneness". Last night I saw the "Two-ness". I saw a vision of a membrane that seems to hold the feminine energy. Within it were countless female personalities existing as differentiated protrusions extending along the surface of the membrane. The personalities were both known and unknown to me and I realized that all women exist as part of the same feminine fabric. The feminine membrane co-exists with a similarly-structured masculine membrane. I assume that my viewpoint was from within the masculine membrane. The two membranes glide along the surface of the other allowing the points of masculine and feminine differentiation to interact. 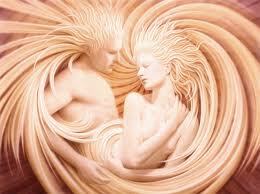 The masculine and feminine exist independently and interact with each other dynamically. In places, the two membranes come into close contact at points of interaction between male and female points of differentiation. In places, the two membranes are attached or entangled. There were notable large regions where the two membranes appeared to separate from the other -- perhaps, repelling each other. In those regions, some of the differentiated personalities on either membrane appeared contracted and others appeared scorched or damaged. What unfolded seemed to be a vision of the balance and creative forces between two universal energies. I focused on the unity structure of the masculine and feminine realms and the qualitative distinction between them. I felt that the force of interaction is love manifested at the counterpoints of differentiation. I sensed that the masculine membrane was firmer and more uniform than the feminine membrane. The feminine membrane seemed more elastic and fragile -- more damage was noticed there though that perception may have been due to the view from my perspective. The damaged areas appeared to be due to prior interaction with the forces of the other membrane. The regions of separation between the membranes seemed to be manifestations of what we might term gender issues in the physical realm. The personalities damaged by such interactions lacked the love energy to attract the other membrane. Like all things in the astral, there doesn't seem to be a right or wrong about it -- that's just the way it is. Intellect began to analyze the vision before I could see further into it and effectively brought it to a close. My eyes opened and I looked at Lili. In her, I saw the other women I have known. They were one -- extensions from the same force. Note: My interpretations of what was seen are subjective to both intellect and ego.